SO IT IS finally here! After decades of planning, posturing and pain, Oldham Town Centre now has its own direct tram connection with Manchester City Centre. And tomorrow, it’s the world! Well, via Manchester Airport at least, when the next expansion of the network connects us to the international airport, plus the city region Enterprise Zone, where plans are in place to create more than 13,000 new jobs. Oldham felt very different to me on Monday, and I know many people shared that sensation, but that isn’t to say we’re claiming that everything is now sorted for our town centre – far from it. We know there remains a great deal left to do. Metrolink is the spark for our renewal and I hope people who live and work here can see the importance that all these different schemes are going to have for our future prospects. This isn’t just about building a tram. It’s not just about building a cinema or restaurants – and it isn’t just about new shops, offices, a leisure centre or a college. It’s about having the courage to hope and aspire – and to build confidence. Even now some people remain unconvinced of our intent and I suppose that’s reasonable given the time it’s taken to see some schemes come to fruition and, let’s be honest, some over the years which haven’t come off at all. I offer no explanation to the past, but I do take personal responsibility for what happens now. And I do know that every member of council staff and much of the wider community are beginning to believe that Oldham is now on the verge of something very special indeed. You’ll probably have seen the first artist’s impressions released this week, for example, showing the stunning new leisure centre planned for the town centre. It’s just one of many schemes on the table (of which there is more detail and announcements to come) including the cinema, new Coliseum, Heritage Centre, Hotel Future, plans for our markets plus developments to attract new retailers, both national and independent. Put them all together and I hope you can see that Oldham is ready to come out fighting from the recession. Huge projects like Metrolink will, of course, involve changes and inevitably there is always a settling-in period when people have to get used to new arrangements. That, at least, is what I hope explains the recent sheer stupidity of some drivers who think that rushing out for fried chicken or a kebab is far more important than the tram being able to drive down Union Street safely. The Oldham Chronicle has done a fine job in helping us to raise awareness of this problem and it has prompted myself and several other residents to nip out with camera phones to snap the worst offenders. We began enforcement action with a CCTV car on this just before the Christmas holidays. Between December 23 and January 11, over a period of 12 days, it issued 44 enforceable Penalty Charge Notices (PCNs). Yet the problem has worsened since then. In a five-day period from January 13 we issued a further 98 PCNs and, despite all the publicity, the problem is not abating. 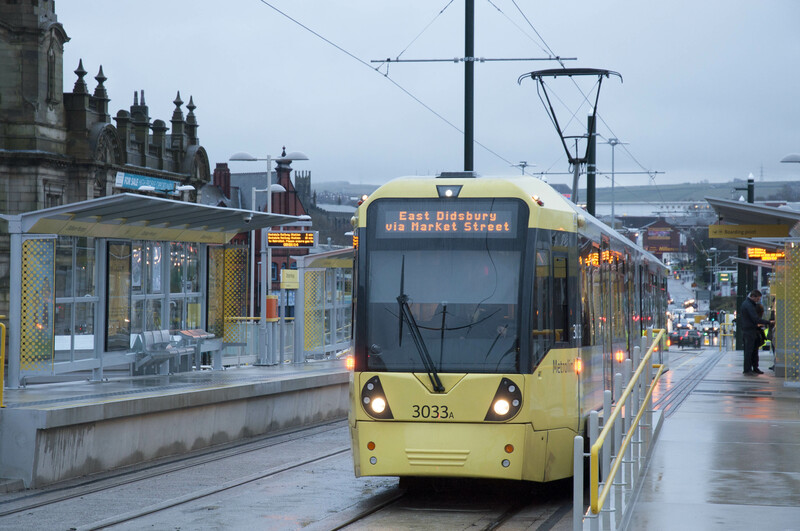 In the last week before Metrolink opened on Monday another 122 PCNs were issued and sadly, this week, we are still dishing them out in considerable number. The offences vary from blocking the tram line, parking completely on the new (and expensive) footpaths, over double-yellow lines and mounting kerbs. Perhaps this is proof – if it were needed – that some people need a refresher course in the Highway Code, common sense and taking responsibility for their own actions. The Oldham Chronicle (January 29th edition) highlighted one driver who double parked and blocked the tram lines to collect his takeaway. When the tram stopped at the blockage and sounded its horn the driver reappeared – only to shout abuse and simply go back into the shop for his meal. Anyone can make a mistake, but it takes a special kind of selfish individual to behave like that. Last Friday I witnessed similar antics as I walked down Union Street. SELFISH: Union Street has been plagued by problem parking like this. A car (pictured, right) pulled in across the parking bay and onto the footpath. Having gone out of my way to take a photo of this stupidity, the driver asked me why I was so interested in his parking. I told him it was because he was blocking where pedestrians want to walk. He simply put his window up and drove away, regaining his courage later on Facebook to state that he could park wherever he wanted and there was nothing the council can do about it. 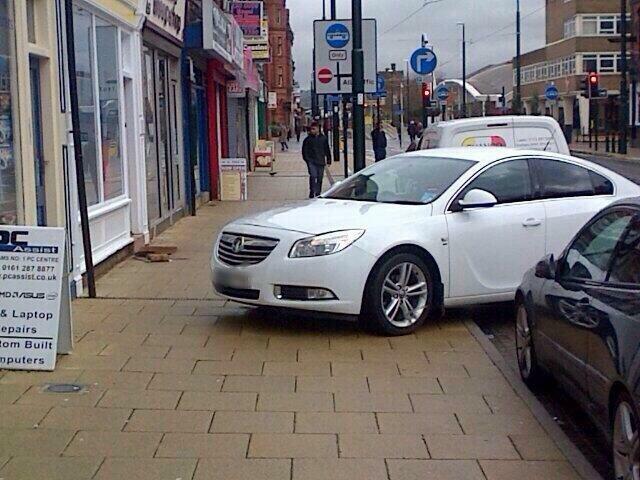 He is correct in saying that the council has no powers to stop pavement parking, but the police do. They have been passed the photograph and screenshots of his Facebook comments. Let’s see if they have a word. Over the top, perhaps? You decide. What has given me hope is that residents like myself, fed up with this selfish and inconsiderate parking, have been ‘snapping’ examples and posting them on Twitter. This is a good example where Social Media can give real ‘power to the people’. Perhaps some of these motorists will now be reflecting whether a £70 ticket was really worth them not bothering to park for free around the corner and walk a few yards? I hope so. But even those minor hiccups can’t be allowed to take the gloss off the arrival of Metrolink this week, which is a game-changing new opportunity for Oldham. Metrolink is here to stay – and you can’t block progress! Emma from the Rainy City Roller Girls here! The tram is a great boost for us as a sports club and will encourage more people to come along to our games and taster sessions. We’ve occupied the old Astoria building for the past few years now and with our recent grant from Sport England, we believe that we’re a great example of the regeneration of Oldham too. Not only have two of our skaters just made the Team England roller derby team, but we have big things planned this year that will definitely put Oldham on the map! After 5 years of trading online, and looking at many shops since, we have just taken a lease on a shop in Yorkshire St. Its a big step for us, but one that we have taken because we are so confident in the future of our town. Its exciting to be one of the first independant traders to buy into the councils Yorkshire St/Union St Trinagle vision. Mick , Scoots Suits and Boots,com And Proud Oldhamer. I’m with you 100 percent on the issue of inconsiderate drivers. All power to your elbow in addressing this deeply annoying problem.